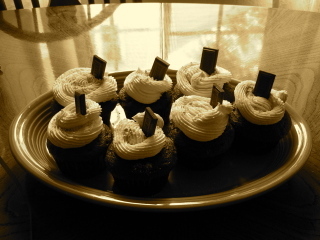 Make your favorite chocolate cupcake. Mine was a box mix as I was busy making guacamole and sewing favor bags. Cream the butter on high until it's light and fluffy. Add the confectioner's sugar, 1/4 cup at a time, and beat until fluffy each time. Beat in the vanilla until incorporated. Then dump in the Fluff and mix it up 'til it's all creamy. Transfer to pastry bag (if desired) and pipe onto cupcakes! Dust tops with graham cracker crumbs and stick a Hershey's chocolate square into the top. 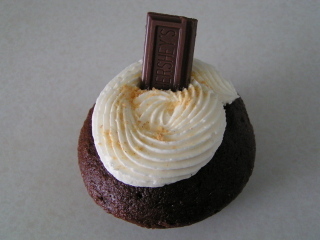 I use a big pastry tip, poke it down into the cupcake to fill it a little and then swirl the tops a'la King Cupcakes. They are a little messy this time but my nieces and nephew didn't mind. oh my, now i'm totally gone! thanks for sharing these yummy little things!! they look really amazingly yummy! I tried to talk my s'mores loving son into having them for his bday party (this sat, turning 8(!!) on Thurs) but he said no. Perhaps I need to show him your photos? hmmm. He's having a 'sports' themed party, so his cake will probably be decorated like a baseball.